Yes, that’s true! You can now pre-order iPhone 6 and iPhone 6 Plus in India on Flipkart and Amazon IN. Yesterday, we saw some teaser posters reporting iPhone 6 and iPhone 6 Plus pre-orders to be started on both these websites at 12PM on October 7th and just now they have began accepting pre-orders for these devices. You just pre-order them now and receive it on 17th October(hopefully). 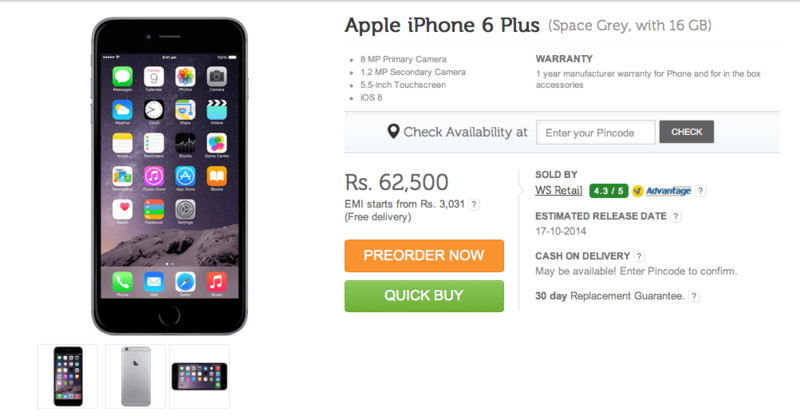 As shown above, Flipkart has already started taking iPhone 6 and iPhone 6 Plus pre-order in India. The smaller iPhone, iPhone 6, can be pre-ordered by paying full Rs 53,500 while the bigger one, iPhone 6 Plus, can be ordered by paying Rs 62,500, both for 16GB variant. Amazon IN will also be providing pre-orders, very very soon.